In July 2017, a huge iceberg dramatically broke away from the Larsen C Ice Shelf on the Antarctic Peninsula. But the aftermath has been a bit more drawn-out, as the berg hasn’t moved very far. 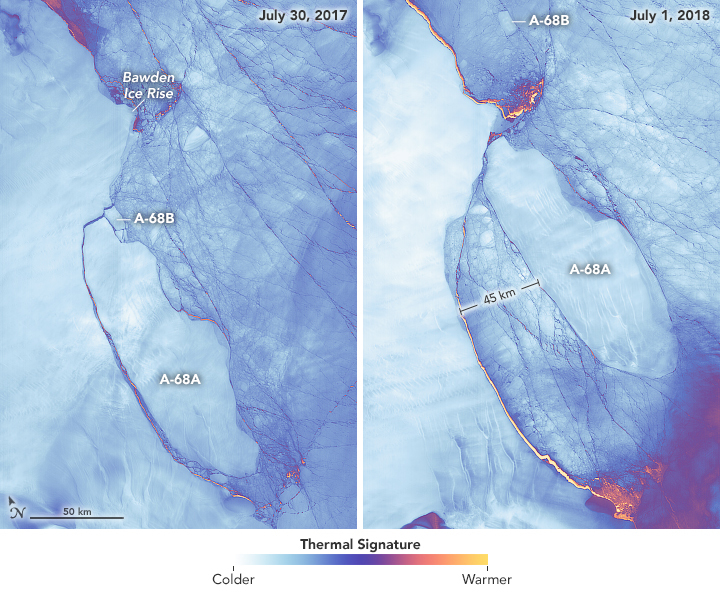 The left image shows Iceberg A-68 on July 30, 2017, soon after it broke away from the shelf and then fractured into two pieces known as A-68A and A-68B. The right image shows the same area on July 1, 2018. Both images are false-color, acquired with the Thermal Infrared Sensor (TIRS) on Landsat 8. Colors indicate the relative warmth or coolness of the landscape, from orange (warmest) to light blue and white (coldest)In a year, iceberg A-68A moved a relatively short distance from the edge of the ice shelf into the Weddell Sea. In the right image, the berg’s western edge is roughly 45 kilometers from the shelf. A-68B, the much smaller fragment of the original berg, is more than twice that distance from its prior location.